Published on 27 July 2008. 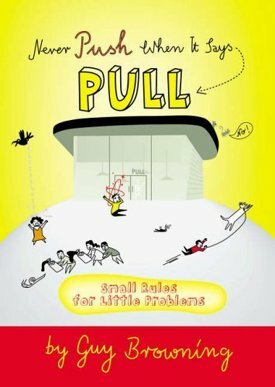 The fifth book I’ve picked for my Summer Books series is perhaps the most summery of the bunch so far: Never Push When it Says Pull: Small Rules for Little Problems by Guy Browning. Guy Browning is one of a very few newspaper columnists whose pieces genuinely make me laugh out loud, thanks to their absurdist satirical view of everyday life. Browning’s How to… column in the Guardian is one of the joys of my Saturday mornings, and this book is the second collection of these columns – a follow-up of sorts to the previously reviewed Never Hit a Jellyfish with a Spade. The fact that I find each individual column laugh-out-loud funny means that the book is like a little bundle of hilarity, which, whilst good for me, is perhaps not such a good thing if you happen to live with me or sit next to me on public transport – unless, of course, you like the sound of apparently inexplicable hysterical laughter at random moments, and public book readings from some seemingly crazed idiot. Unfortunately, like most things in life, the columns lose all humour when read aloud by someone who can’t stifle their manic giggling, and so it’s crucial that you, dear reader, become the first person you know to read this book. And, surely, this summer provides the perfect opportunity to enjoy some light humour. This is the first of my Summer Books which both I and everybody I’ve shared it with have really enjoyed – so I guess it’s probably a pretty safe summer bet. An earlier version of this review was posted here on sjhoward.co.uk in October 2005. It has been extensively rewritten for the ‘Summer Books’ series of reviews published on sjhoward.co.uk and Gazette Live. This 1,360th post was filed under: Summer Books, Books, Gazette Columns, Guy Browning. Trackback received at 23:44 on 17th February 2012.